This article was originally dispatched as part of Epoch Times’ China email newsletters. Subscribe to the newsletters by filling your email in the “China D-brief” box under this article. It’s been obvious that the Chinese Communist Party (CCP) has been trying to send a message to Taiwan. Over the last couple months, these warnings have gone from vague, to obvious, to plain as day—and this very likely has something to do with Taiwan’s 2016 presidential elections leaning in a direction it doesn’t want. 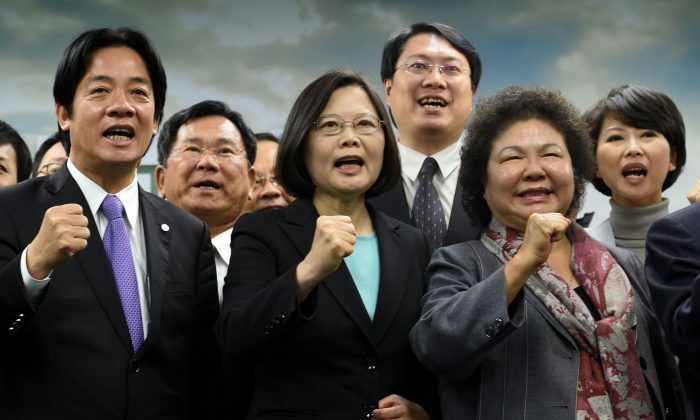 As IHS Jane’s reported, the military exercises coincided with Tsai Ing-wen, the candidate for Taiwan’s Democratic Progressive Party, visiting the United States between May 29 and June 3. In other words, the drills were meant as a warning, with Wen’s presidential campaign as their target. These warnings soon got louder. CCTV, one of the official mouthpieces of the CCP, aired a video on July 5, which showed a military drill in Inner Mongolia, where its troops attack a building that looks strikingly similar to Taiwan’s presidential office. Then, perhaps fearing that Taiwan still hadn’t caught their drift, the CCP came out directly with its line in early August. The statements were from Zhang Zhijun, head of China’s Taiwan Affairs Office and the CCP’s top policy maker in Taiwan. Zhang stated, according to Reuters, that Taiwan could keep its ties to the CCP and “enjoy the peace dividend,” or it could return to its “evil ways” of independence. Its important to understand the political climate in Taiwan, and why the CCP isn’t happy about it. The incumbent, Ma Ying-jeou, is part of Taiwan’s Nationalist Party, which is widely criticized for being too friendly with the CCP. According to opinion polls, Ma is about 20 points behind Tsai, and Tsai’s party is openly opposed to the CCP’s efforts to absorb Taiwan. Forbes reported that Ma’s nationalist party faces almost certain defeat to Tsai. Taiwan is a kind blemish in the CCP’s propaganda, which trumpets phrases like “there would be no new China without the CCP.” With a democratic Taiwan just across the channel, Chinese people can roll their eyes, look at Taiwan, and see a modernized Chinese society that functions just fine without totalitarian rule. With the upcoming elections, it’s looking like the CCP’s efforts to slowly reel in Taiwan could soon fall apart. The story includes some folks at the head of the CCP’s plans to absorb Taiwan lamenting about the likely shift in politics, which could uproot the CCP’s efforts. “(Cross-strait relations) won’t be smooth sailing all the way from now on,” said Chen Deming, president of China’s Association for Relations Across the Taiwan Straits, according to The Straits Times.